From 23-26 October, Euronaval 2018 will take place in Paris le Bourget, France. This leading international trade show for maritime security, safety and naval defense is held every two years and is considered the ‘world meeting of naval technologies for the future’. Hull Vane will exhibit at Euronaval for the second time, make sure you don’t miss our innovation. The Hull Vane® is a proven solution to reduce the fuel consumption of naval ships by 10 to 25% and to improve their seakeeping. 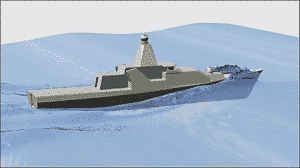 It also leads to a significant improvement of the comfort, safety and operability in waves of OPVs, corvettes and frigates. Because the propulsion power, the propeller loading and the stern wave are reduced, there is also a positive influence on the ship’s visual and acoustic signature. And when sailing in waves, helicopter and drone operations are made safer by the reduction of the vertical accelerations and sideways movements of the helo-deck. This year we will present two projects that we delivered in the past year: a midlife upgrade with a Hull Vane® on the 52m Offshore Patrol Vessel Thémis of the French Affaires Maritimes, and the integration of a Hull Vane® on the newbuild 25m harbour patrol vessel RPA-8 for the Port of Rotterdam. We will showcase a scale model of both vessels including the Hull Vane®, and show a video that shows the whole retrofit process and the results of the sea trials and model tests: 18 to 27% lower fuel consumption on Thémis and 22 to 29% lower fuel consumption on RPA-8. In both cases, the result is also very visible in the reduced stern wave and wake turbulence. Find out how the Hull Vane® improves naval capabilities such as top speed, range and seakeeping while reducing lifecycle costs and environmental impact? Ask us how this can help shipyards to win public tenders? We invite you to come and meet our team: Sales Director Bruno Bouckaert, Managing Director Niels Moerke, Project manager Tijmen Maas Geesteranus and PR and Marketing manager Minka Zeilstra. Hull Vane will be present at booth I110! If you would like to receive a free dayticket (only for professional visitors), please send an e-mail to info@hullvane.com on the attention of Minka Zeilstra.